The influence of prolonged climatic changes on the terrestrial ecosystems of our planet is generally known; however, how and to what extent short-term climate extremes can have a definite impact on ecosystems is barely described. The variables involved are too numerous, and observations and measurements in the field are usually too short term. In a recent study, scientists from the Max Planck Institute for Biogeochemistry (MPI-BGC), Jena, and international partners were able to describe the consequences of extreme weather conditions using Spain as an example. The scientists investigated the effects of the exceptionally warm winter 2015/16 and the subsequent rainy spring on the ecosystems of the Iberian Peninsula. 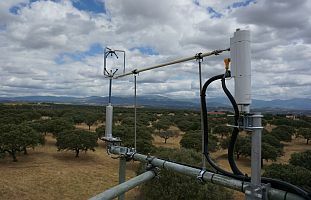 They were able to use measurement series from the Majadas de Tietar field station in Extremadura, Spain, which has been continuously surveyed for 13 years. The locally measured data on temperature, precipitation, and carbon fluxes were compared with satellite data on regional photosynthesis activity (FAPAR) but also with large-scale model analyses. The evaluation of the study shows an effect that has been given little consideration: under these special weather conditions, photosynthetic carbon uptake, called gross primary production, increased, which can lead to higher biomasses and crop yields. Thus, the succession of a very warm winter and a spring with abundant rainfall enabled exceptionally good conditions for plant growth over a longer period of time. Interestingly, neither the warm winter 2015/16 nor the following moist spring were considered "extreme" on their own. Nonetheless, both led to an exceptionally positive ecosystem response. Furthermore, rising CO2 concentrations in the atmosphere generally promote vegetation growth and have likely additionally contributed. In principle, an increased probability of warm winters is to be expected in the future. Yet, there are no indications of general increases in spring rainfall - a prerequisite for high vegetation productivity. With the higher temperatures in winter and increased rainfall in spring, the ecosystem respiration, i. e. ecosystem CO2 release, also increased at the same time. As a result, the overall balance of CO2 absorption and emissions was not significantly changed. The positive conditions for plant growth could therefore not at the same time strengthen the carbon absorbing ("sink") function of the ecosystem. The study, with partners from Norway, the United Kingdom, and PIK Potsdam, was one of the first studies to investigate the impact of climate extremes and their changes (due to human activity) on ecosystems. It was published in an annual special report by the American Society for Meteorology, which deals with the question of how man-made climate change could have influenced individual extreme events and their impacts in the previous year. The study was additionally supported by the European Space Agency ESA, the Max Planck Research Award of the Humboldt Foundation to Prof. Markus Reichstein and the EU-funded project "BACI: towards a Biosphere Atmosphere Change Index" at the MPI-BGC.